The text is comprehensive and isn't lacking in any way. 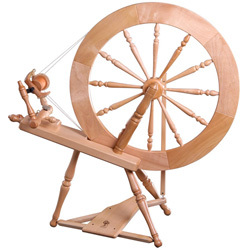 From selecting a fleece (with a table of popular British breeds and their properties) through spinning with a spindle and a wheel to skein and ball winding and knitting with your handspun. The plain-English and straight-to-the-point-style makes it very easy to read and understand (although a background image does obscure the text a little bit on a couple of pages). It is definitely aimed at beginners but does take us to the next level with topics such as woollen / worsted yarn and some fancy techniques. The photographs have a little bit of a homespun look but they're plentiful, clear and illustrate the text well. The topic of hand knitting your handspun yarn and the necessary considerations is important but often overlooked or only touched on. Claire Boley gives us a whole chapter and a pattern for a hat with a rolled brim; easy to knit and a good introduction to knitting with handspun. Natural dyeing is covered in a single chapter, starting with a double-page spread showing some of the surprising colours that you can obtain using natural dyes. 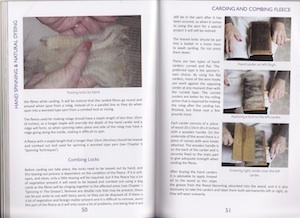 The following dozen pages give recipes for dyeing with 'found ' and 'bought' substances with some basic instructions for dyeing and mordanting. Unfortunately, other than a few at the start of the chapter, there don't seem to be images of the colours obtainable for each of the many recipes; only the berries, flowers and leaves themselves. 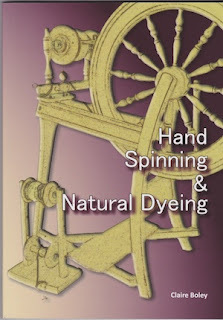 The combination of hand spinning and natural dyeing is a good and unusual one. The book comes from the The Good Life Press, who are also responsible for Home Farmer magazine, so it is obviously aimed at those of us keen on doing things from scratch the natural way. I'm very happy to recommend the book and I hope to have copies available at handspinner > books very shortly. It will retail at £12.99 and make a nice and slightly cheaper alternative to the Ashford book of Hand Spinning, Spin to Knit and Start Spinning , especially if you're interested in natural dyeing as well as learning to spin. love woolly books! Thanks for the review.